Dive-In French fries with secret sauce with grilled chicken breast sandwich. 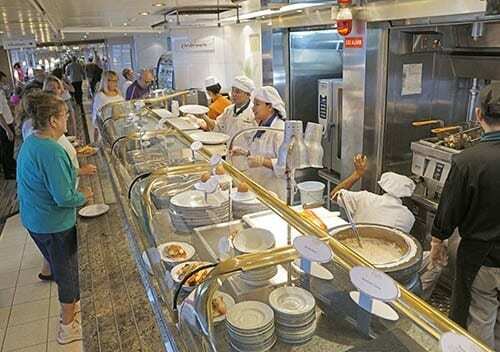 ABOARD THE EURODAM – Can the world’s best French fries be found at a floating fast food stand? Better yet, can you order these crispy, crunchy, double-fried delights without standing in line? 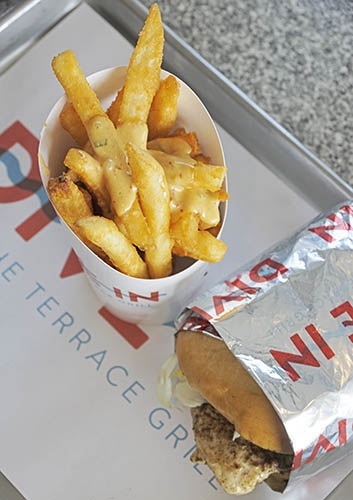 Just place your order – naked fries, smothered in melted cheese, or with a side of secret sauce – then go lounge by the pool until your beeper alerts you that your piping hot potato-strips-from-heaven are ready for pick up. 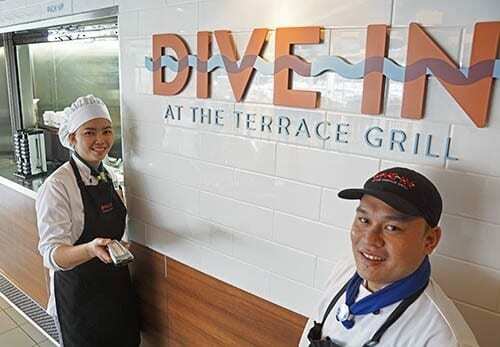 Only one of the new innovations in food quality and service aboard the Eurodam, the fantastic fries at the newly renamed poolside “Dive In at the Terrace Grill” can now be ordered with a complement of newly conceived hot dogs, burgers, chicken or veggie sandwiches. 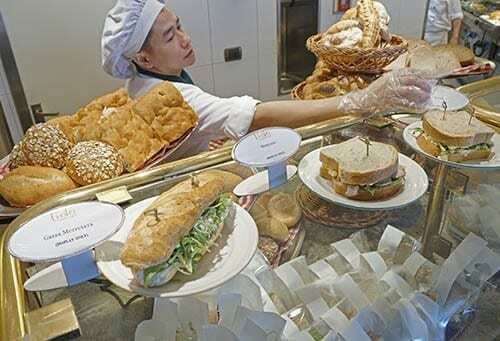 All are served on buns freshly baked on the ship. Eurodam Dive-In at the Terrace Grill crew with buzzer to signal order is ready. There are three choices of 100% All Beef Nathan’s hotdogs and three choices of burgers at the Dive-In. The hotdogs, served in poppy-seed buns, are the Dive-In Dog with American yellow mustard, relish, and crispy, frizzled onions; the Dog-Paddle, topped with sauerkraut, German mustard and the secret Dive-In Sauce; and the Dunkin Dog, topped with melted cheese sauce, jalapenos, red onion and Dive-In sauce. All three hamburgers come on freshly baked, toasted brioche buns, which are firmly textured with a nice touch of sweetness. In addition to chopped lettuce, tomato slice, and Dive-In Sauce, The High Dive comes with American cheddar cheese; The Cannonball with Gouda cheese, Applewood smoked bacon, and sweet caramelized onions; and The Gainer with a mound of crispy, frizzled onions. Additionally there is a grilled chicken on brioche bun with avocado, lettuce and tomato, and Dive-In Sauce. And for vegetarians, a grilled Portobello mushroom, avocado, lettuce and tomato, and Dive-In Sauce on whole wheat bun, which I enjoyed with my order of fab fries. The only proviso, in case you choose to skip the Lido and other ship restaurants for all your meals, just to get those Dive-In fries is don’t ask what’s in the sauce. They really do mean it when they say it’s a secret. My observation is that the Lido Restaurant is the throbbing heart of the Eurodam. at it’s most chaotic. Faced with an almost overwhelming plethora of choices, congestion would be the expected result. Nevertheless, the numerous lines flow reasonably well despite the challenge of assembling a meal from various serving stations. Salads, for example, can be gathered from over thirty ingredients – including new varieties of cheeses, grilled chicken, ham, or turkey strips, and fresh tuna steak, but not counting breads and fruits – at the two long salad bars. Eurodam Lido Restaurant freshly baked bread and sandwich server. New innovations include a sushi bar with four kinds of sushi daily prepared by two Indonesian sushi chefs. And for another nifty international touch, there is now a Flavors of the World section which changes cuisines every day of the cruise. On our 12 day cruise the dishes included Thai, Cantonese, Indonesian, Indian, Korean, Vietnamese, Japanese, Malaysian, Sichuan, mixed Asian, standard Chinese, and Filipino, all mostly prepared by Filipino cooks. This new direction for the Lido is perhaps best reflected in bread boarder sandwiches, five kinds changed daily. Made with eight types of breads, freshly baked in ovens in the ship’s galley, the sandwiches are prepared on the spot and wrapped to go. For those going ashore on excursions – sandwiches must be picked up before 5PM on the day prior to the excursion – or just to take back to the stateroom, this makes for a handy lunch. Diners in Eurodam’s The Pinnacle Grill. And while you’re contemplating bread, be sure to seek out the “fantasy rolls” in the Lido made with olive oil and herbs that flake apart. Just tell any of the staff that Chef Shehab sent you. And finally, here’s a Lido scoop. Around the end of this year many of the evolving changes already in place will be fully instituted as the “New Lido Market” concept in all HAL ships. 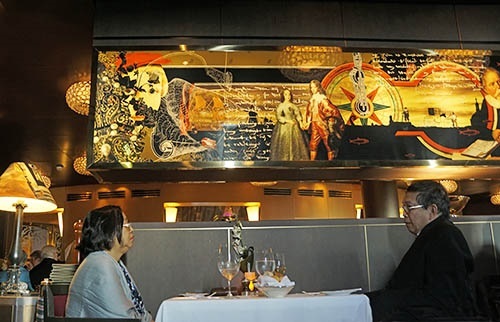 Another new Eurodam experience for us was this evening’s dinner at the pinnacle of the ship’s specialty restaurants, aptly named The Pinnacle Grill, at an extra charge of $29 per person. Renowned for it’s intimacy and romantic atmosphere, The Pinnacle Grill is accoutered with fine Bvlgari china, Riedel stemware and Frette linens. 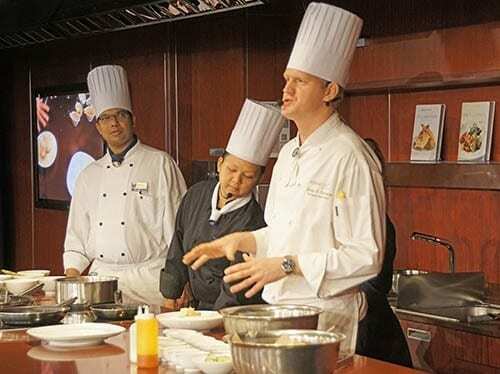 Cooking demonstration by chefs of the three Eurodam specialty restaurants: (l to r) Cannaletto, Tamarind, and The Pinnacle Grill. To experience this dining classic, booking early is essential. That’s especially the case on the two evenings when The Pinnacle features the modern innovative menus of two internationally famous restaurants, Le Cirque in New York City and the 3 Michelin Star restaurant in Zwolle, the Netherlands, De Librije. The extra charge for each of these evenings is $49 per person. We’ll report later on after we reacquaint our palettes with the other two specialty restaurants on board, the Canaletto and Tamarind, both of which we enjoyed on our previous Eurodam experience. In the meantime, we’ll consider the example of the alleged Eurodam passenger who keeps returning to the ship for those Dive-In French fries. No word yet if there are any passengers rebooking for more nights at The Pinnacle Grill. But when they do, I’d advise to avoid the fancifully named shoestring fries and go up to the 9th deck for the real thing.